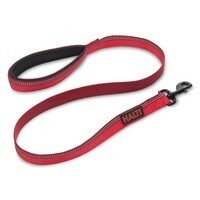 The Halti Walking Dog Lead is an essential accessory that can be used by dog owners on a daily basis. Featuring a super soft neoprene handle to ensure the comfort of the handler in any eventuality, the lead has been made from a high quality nylon that has been chosen for its strength and durability. 3M Scotchlite reflective strips run the entire length of the lead and will help to provide safe visibility even in low-light conditions.